Joanna Wittmeier came to Concordia from a homeschooled family, not having any idea what to expect here. She had spent a year in a classroom at Centre High, where a counsellor pointed her toward the university and the possibility of teaching music. She planned to devote herself to playing the piano, a passion shared by her late Opa and dear aunt, and encouraged by opportunities in her church. But she had no idea the music program here would expose her to arranging or ear-training. Or that she would encounter, and love, conducting, choir, and chamber music! Nor did she realize what being part of an ensemble could offer. 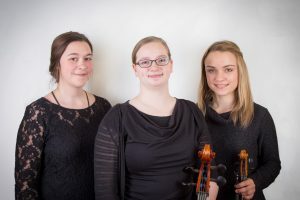 She also had the opportunity to develop her skills as a cellist and chamber musician under the mentorship of Danielle Lisboa in the trio Ombra di Musica, along with fellow graduating students Christina Sawchuk (piano) and Natalie Tederoff (violin). For the past two years the three have grown in relationship as musicians and as individuals, and in experience playing for various events on campus and around the city. “The better we know each other the better we work together and ‘read’ each other,” she notes. They hope to continue growing as an alumnae ensemble, and there has been talk of finding sponsors for a trio tour. The support and protection afforded by an ensemble, choral or instrumental, speak powerfully to Joanna. As a solo performer she feels very exposed. But in an ensemble, she points out, “if we make mistakes we ‘catch’ each other. It’s such a supportive environment. And I enjoy it a lot more!” She has even been drawn into the orchestral world through participation in the Concordia Symphony Orchestra. She is alone in the spotlight, however, in her solo piano recital April 14. (For most of it, anyway . . . no spoilers here!) Through some favourite Romantic pieces as well as classical and Baroque works Joanna will channel the emotion grown up around a lifetime of family memories and support. With the guidance of piano prof Ping-Shan Liao she has prepared a diverse program, including works by beloved composers like Beethoven, Chopin, and Scarlatti. One composition, “The Lark” by Glinka/Balakirev, actually inspired the theme of her recital, Taking Flight. 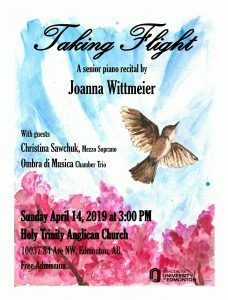 She commissioned her sister to paint the watercolour that graces the recital poster, from Joanna’s own sketch. Both music and artwork depict how she feels leaving what she now calls the “nest”—the “secure place” that Concordia has become for her—as she spreads her wings and sets out on a new journey. A journey, largely unmapped, as piano teacher, emerging chamber musician, and Concordia alumna. Taking Flight is free and open to the public, with reception following. Details here.